This weekend we weathered the big snowstorm here on the east coast of New Jersey. We endured blizzard conditions with driving snow and high winds all day Saturday and try as we might, could not shake that “Hurricane Sandy” feeling left over from the fall of 2012. Back then it was the wind that did the most damage where we lived, toppling trees and downing power lines all over Ocean County. When the power finally went out it did not come back on for 6 days…the first time! Then it was another 4 days without power after that. And as we sat and watched the storm raging outside on this cold and snowy Saturday in January we felt certain that the power would go once again. But this time it was mid winter and not mid autumn. During Hurricane Sandy folks in the neighborhood had to eventually evacuate because the cold autumn nights grew colder. Without power there was no heat for most households and the nights became too cold to stay in a dark and frigid home. But here in 2016, it was January not October and already too cold to stay in a house without power. So what would we do if the lights went out? We looked towards the driveway and our car and knew that we could not even drive to safety this time because we were not only snowed in…but plowed in too! Just about the only people to be seen on the streets during this storm were those who were diligently working the snow plows. But with the cold and wind and wet snow our driveways were now completely sealed off by mini ice damns created by the plows that had been moving up and down our streets…And then, as fate would have it… the power went! It was nearing dark and my wife and I looked at each other and decided that we had to go out and shovel and clear the car and break up that ice damn in case the power didn’t return within a few hours. We called the power company for reassurance but there were no human voices to ease our fears…only a computerized facsimile that promised that power would be restored to our area by 9pm on the 24th of January…but this was Saturday the 23rd! So out we went into the blizzard with our shovels and frazzled nerves and began to dig, just in case an emergency evacuation towards safety and warmth would be needed. And we weren’t alone… for as we glanced up and down the street it soon became obvious that everyone on the block was thinking the same thing. Shovels and snow blowers were everywhere, digging and digging, pushing and blowing, and moving up and down the street to assist one another as each driveway’s ice blockade slowly and steadily was broken down. It was now dark, but fortunately the full moon behind the blowing clouds, provided an eerie illumination to the road and our combined handiwork. Our hard shoveling had paid off and our driveways were cleared to the road. We could take a breath and relax, and even though we were warm now from our hearty exertion, we knew that soon when that warmth wore off we would feel the cold again, and though retreating inside would warm us for a while, if the power did not return, we would have to leave our homes soon thereafter…But at least we now had a means of escape! 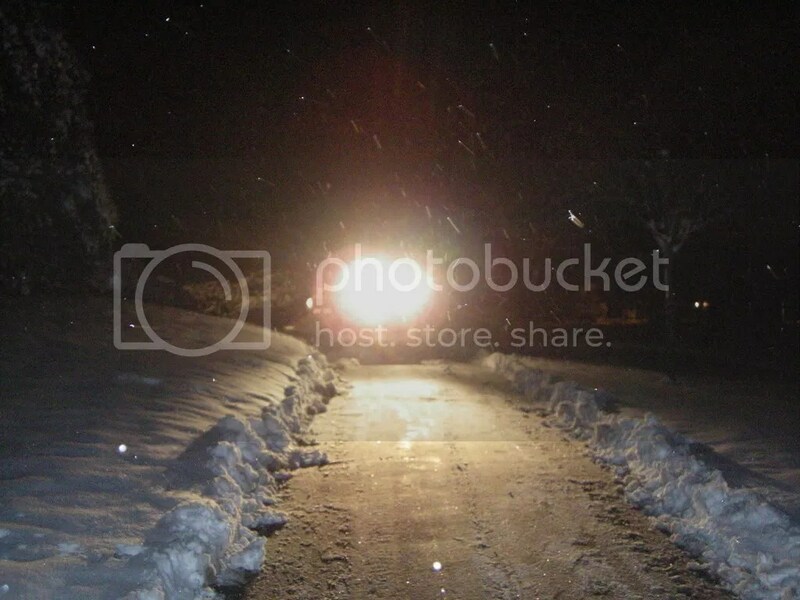 And then they plowed us all right back into our driveways! Here on the East coast of New Jersey winter storm Jonas is about to hit! And what are we humans doing? Food shopping of course! The grocery stores here are so crowded that one would think that we New Jerseyans hadn’t eaten anything in 3 weeks and aren’t expecting to be able to go outside again or get near a food store for 3 more! After all it’s only going to snow for about 8 to 10 hours and most of that will happen over night when most of us usually do our sleeping. And then we’ll get up and shovel our driveways and the temperature will rise above freezing and…we’ll be free again! Free I say! But why take chances? There’s nothing like the threat of snow to bring out the gluttony in everyone! What if we are trapped inside of our houses for most of the day and have to eat everything in our cupboards just to keep warm? Then what will we eat tomorrow? Is 10,000 calories enough? 20,000? What if we humans lived on the planet Venus where it storms all of the time? We’d all be in a perpetual state of food shopping and living in fear of going without cupcakes! Just Imagine how happy grocery chains would be in a place where there was always the threat of bad weather…but it never came? Now just think about how awful it must be to live in a food desert? You know, one of those places here in America where it is unprofitable to run a supermarket or grocery store because the people there don’t have enough money to shop… until they drop. Grocery chains don’t really care what the weather is like in the inner cities I suppose. And the poor people there must spend a lot of time praying for sunshine… and manna to drop from heaven. So we can go out in our SUVs… and get some more food. I usually like to watch the Republican rebuttal to the State of the Union Address but this year I missed it, so I have had to read about it. Once again I am completely stumped as to where the Republicans find their rebuttal-ists… and what planet they find them on. Good grief! I’m wordless… Can anyone please tell me…Do Republicans go to school? Ever? Here’s an interesting possibility. Senator Marco Rubio, from Florida, is running for the Republican nomination for President of the United States. He was born in Miami, Florida in 1971 so he is an American citizen. However, his parents were not citizens of the United States at the time of his birth and didn’t become citizens until 1975. So for all intents and purposes, Marco Rubio can be considered an “anchor baby” which is a term used to refer to a child born to a non-citizen mother in a country which has birthright citizenship, which many folks (namely Republicans) view as providing an advantage to family members seeking to secure citizenship or legal residency. In fact Republicans in Congress have supported bills that would deport immigrants and their anchor babies regardless of the fact that anchor babies are legal citizens under U.S. law. Now imagine that Senator Rubio wins the Republican nomination and then the presidential election and becomes the next President of the United States. Then imagine that Congress passes a law deporting non-citizens and their natural born American babies. President Rubio could be the first president ever to be deported by Congress! Pretty silly huh? And ridiculously unlikely…but this is why one doesn’t entertain proposals that fly in the face of morality and U.S. constitutional laws. Why or how would it be fair or just to deport U.S. citizens today under different rules while still allowing the U.S. citizens of yesterday, who became citizens under the same conditions and rules that have helped them to obtain citizenship and even rise to the Presidency of the United States, to remain here as U.S. citizens? Maybe we should just deport everyone? America has always been a nation of immigrants. And we former immigrants need to stop listening to all of the complaining and useless rhetoric and just get used to it. This just in! Total student loan debt in the US has reached 1. 3 TRILLION dollars…and that starts with T, which rhymes with P and that stands for Payments you’ll never finish Paying. Because according to the Associated Press Americans who are between the ages of 35 to 50 still owe as much money on their student loan debt as new graduates do! Thanks to interest… and not the kind that the bank pays you but rather the kind that you pay to the bank when the bank loans you money from the pile of depositors money that they are not paying interest on to depositors… a college loan is the gift that you keep on paying for! There is even a website that you can go to now to watch the U.S. student debt rise as it happens in real time… at a rate of $2,726.27 per second! But Huzzah! The Federal government is stepping in with a plan to cap student borrowers monthly loan payments at 10% of their discretionary income. And since discretionary income is the money you have left after deducting taxes, other mandatory charges, and expenditure on necessary items. (loan payments are now even surpassing groceries as the biggest monthly expense for many households) Which begs the question: Are groceries necessary? College debt is becoming a veritable debtor’s prison, where you get to stay at home, but only if you can afford one, that is.